The area of industrial tree plantations in the Mekong Region is expanding. The pulp and paper industry benefits from these plantations, while the costs are paid by local communities. The area of fast-growing industrial tree plantations in the Mekong Region continues to increase. Proponents of these plantations argue that plantations are established as reforestation programmes, or to prevent soil erosion or flooding, or to reduce pressure on native forests, or to alleviate poverty, or to combat global climate change. However, the main beneficiary of the fast-growing tree plantations is the pulp and paper industry. As the area of plantations has increased, more and more villagers in the Mekong region have seen their forests, fallows and grazing lands replaced with eucalyptus, acacia and pine monocultures. In addition to a cheap supply of wood, paper production requires huge amounts of chemicals, water and energy. In the Mekong Region many of the paper and pulp mills have resulted in high levels of pollution, releasing thousands of polluting substances into nearby rivers, including dissolved chemicals and wood particles. The result has been reduced oxygen levels in rivers and dead fish. 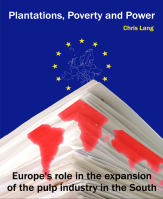 A range of actors works to support policies supporting the promotion of such plantations, including the World Bank, the Asian Development Bank (ADB), export credit agencies, bilateral aid agencies, forestry and engineering consultants, forestry research organisations, suppliers of pulp and paper making machinery, industry associations and alliances and even some NGOs. The large-scale pulp and paper mills in the Mekong region were all built with northern aid, supplied with northern machinery, on the advice of northern consultants. The impacts of fast-growing tree plantations and of pollution from pulp and paper mills have often been devastating for local communities, their forests and their rivers. 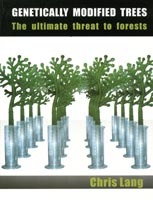 Fast-growing monoculture tree plantations always have social impacts. Although plantations also have impacts on soil, water, biodiversity, it is the people living near the plantations that lose their land and have to deal with these changes. The impacts of tree plantations on villagers and their livelihoods have been particularly clearly expressed in Thailand. 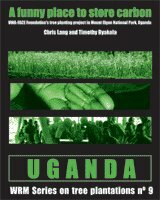 When forests and woodlands are converted to eucalyptus plantations, villagers lose a source of food, medicine and firewood. Water sources are reduced, rice fields dry up. When grazing land is replaced by eucalyptus plantations, villagers lose an important source of income. Charcoal production from branches and fallen wood, another source of local income, also disappears when shrub and woodlands are replaced by eucalyptus. In Thailand, farmers have formed networks with NGOs to protest against the spread of eucalyptus plantations, particularly in the northeast of the country. In Cambodia, villagers concerned about losing their community forests have petitioned the government and held meetings with government officials. In Laos, villagers have declared land as communal grazing land and forest in defiance of the company attempting to enclose the land as fast-growing tree plantations. Many of Vietnam’s plantations have been damaged by grazing, fire or simply cut down by villagers who simply need the land. What the government and its advisers see as “barren land” or “degraded land” is in fact often already being used by villagers. 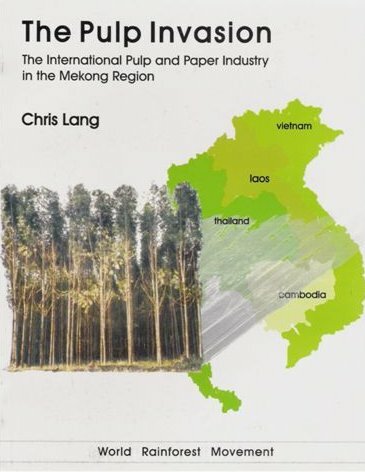 There are at least four important ways in which the expansion of the pulp and paper industry in the Mekong region, as elsewhere in the South, form part of a global process. First the advice that governments in the region receive about the industry comes from northern consultants often funded through multilateral or bilateral “aid”. Second, the financing for the plantations and for the pulp and paper mills comes from the north, in the form of “aid” and export credits. Third, the machinery and equipment that goes into the pulp and paper mills is supplied, developed and manufactured by northern firms. Finally, an important part of the end product, paper, is sold to markets in the north, where paper consumption is many, many times that of any of the countries in the Mekong region. The Asian Development Bank is currently in the process of re-writing its forest policy. A stated aim of the new policy is to “increase the extent and productivity of plantations”. The Bank held a series of workshops in five countries about the proposed policy, since the Bank produced its first draft of the new policy there has been little or no opportunity for public debate on the draft. Perhaps not surprisingly, given the flawed process, the latest draft (dated June 2003) is in many ways weaker than the existing 1995 ADB forest policy. In Thailand, Phoenix pulp and paper’s plans for expansion will only take place if the company can secure cheap international loans and subsidies from the Thai government. Similarly Advance Agro and the Chinese government’s plans to build a new pulp mill in Thailand depend on subsidies, including access to large areas of land, much of which is already being used by villagers. Rather than serving the needs of Thailand’s rural communities, the expansion is to serve an export market and the demands of the international market for pulp. The expansion of plantations in Laos is only possible because the Asian Development Bank is providing cheap loans through its “Industrial Tree Plantations Project“. Meanwhile, the Bank’s consultants work to create the policy framework to enable the expansion of plantations. ADB-funded international “experts” are advising the Lao government to change forestry laws, without the proposed changes being subjected to any sort of public discussion or scrutiny. In Cambodia, although many of the actors involved appear to be local (such as the government and the government’s favourite company, Pheapimex) the World Bank and the ADB are failing to address the problems of logging concessions and the massive land concessions that the government has handed out in recent years. If Pheapimex does build its planned pulp mill, it is likely that the advice, machinery and technology will be supplied—with the support of export credits and aid—from northern countries. The Vietnamese government’s five million hectare reforestation programme is backed by a wide range of international actors, including “aid” agencies and NGOs. Although the programme includes elements other than industrial tree plantations, one of the key aims is to establish two million hectares of plantations to serve the pulp and paper industry and other industrial processes. Perhaps the most notorious forestry consulting firm is the Finnish company, Jaakko Pöyry. Since Dr Jaakko Pöyry founded the company in 1958, it has grown to become the world’s largest forestry and engineering consulting firm, with 4,500 employees. The company is responsible for more than 300 pulp and paper mill projects, in 100 countries around the world. Almost all the bleached kraft pulp mills built in Southeast Asia between 1981 and 1996 used Nordic pulping and bleaching technology. Jaakko Pöyry won the contracts as consulting engineer for around two-thirds of these projects. “The Jaakko Pöyry group played a critical role in brokering the sale of pulp and paper technology in Southeast Asia,” according to David Sonnenfeld of Washington State University. Poyry’s role in the Mekong region is impressive. The company has worked for Siam Pulp and Paper, Phoenix and Advance Agro in Thailand. In Laos, Poyry worked on the ADB’s “Industrial Tree Plantation Project”. In Vietnam, Poyry played an important role in the development of the Bai Bang pulp and paper mill. The company has also worked on proposals for a new pulp mill in Kontum province in Vietnam’s central highlands. International debates on climate change have led to a new impetus for plantation proponents. Under the Kyoto Protocol rules, for every ton of carbon stored in tree plantations, one ton of carbon can be emitted by burning fossil fuels. Through the Clean Development Mechanism, Northern countries can fund plantation (and other) projects which are supposed to mitigate climate change in the South. In return they are allowed to continue emissions at home. Yet the “science” behind these plantations as carbon dumps is fraudulent and corrupt. In recent years, millions of hectares of industrial tree plantations have been certified as “well managed” by the Forest Stewardship Council. Many observers, including many NGOs, see FSC certification as leading to improvements in the way plantations are managed, providing benefits to local communities and the environment. 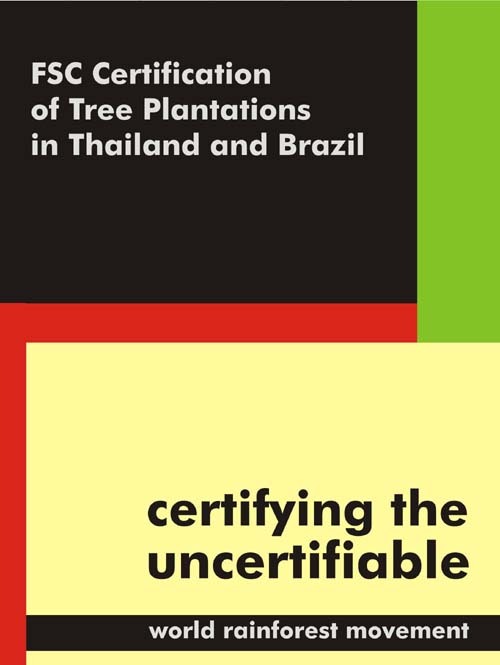 In Thailand, two of the Forest Industry Organisation‘s teak plantations have been certified. However, the certification was based on inadequate information, research and participation and is in fact undermining local environmental and social movements. 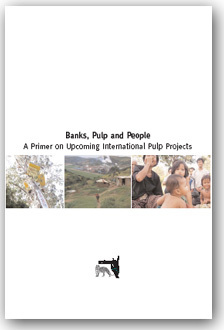 This collection of briefing sheets, reports and critiques is an attempt to shed some light on the processes and actors involved in promoting the pulp and paper industry in the Mekong region. The aim is to provide information and to encourage discussion both in the Mekong Region and internationally and to support the rights of communities to make their own decisions over the management of the rivers, farmlands and forests.